A relative lull in tornado activity in 2018 allowed the year to finish with the fewest number of tornado-related fatalities since reliable records began in 1940. Assuming we get through today’s severe thunderstorms without any significant tornadoes, the United States will end the year with 10 deaths attributable to tornadoes. 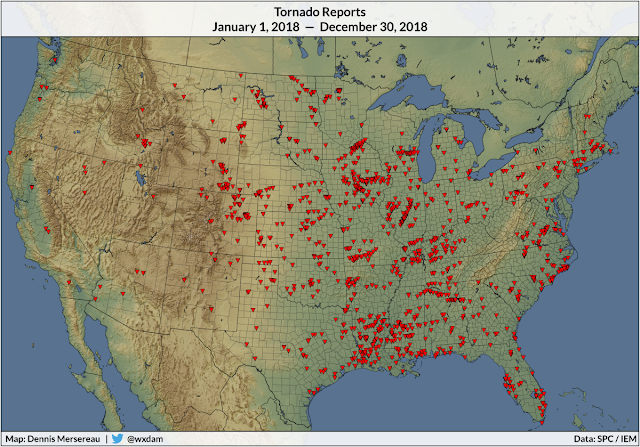 2018 will end with a little more than 1,100 reports of tornadoes submitted to the Storm Prediction Center. A decent number of those reports were sent in for the same tornado—adjusted for inflation, the agency received reports of just shy of 1,000 tornadoes across the country in 2018. An official count of all confirmed tornadoes will be released sometime in the new year. Ten people died as a direct result of injuries inflicted by a tornado according to the latest count from the Storm Prediction Center. 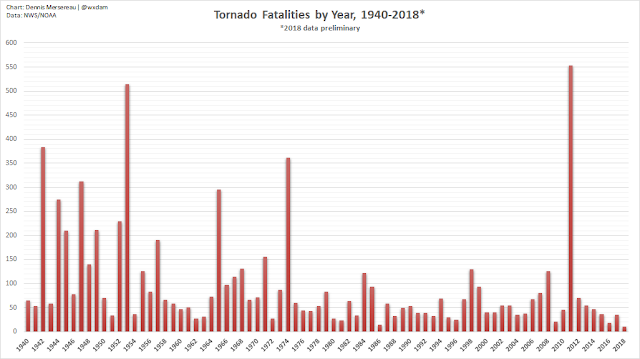 This would be the lowest number of tornado fatalities in a year since the National Weather Service’s database of weather-related fatalities began in 1940. The previous record low occurred in 1986 when 15 people died in tornadoes. Half of this year’s tornado deaths occurred in November or December. Four people died in a permanent building, including two Amazon employees who were killed when a tornado struck the company’s distribution facility near Baltimore, Maryland. Four people died at home, and two others were killed in vehicles. The record-low number of tornado-related fatalities this year is attributable both to the overall downtick in tornadoes this year, the lack of violent tornadoes, and likely an overall trend of better warnings and tornado safety education. The Storm Prediction Center’s inflation-adjusted tornado count for 2018 shows this year’s tornado activity well below average and near an all-time minimum. 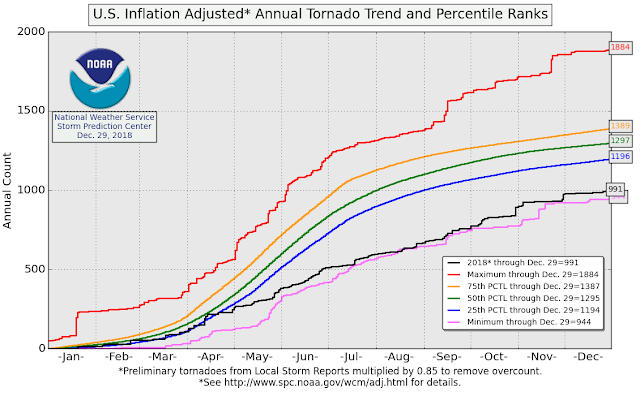 Tornado activity was fairly steady through 2018, steadily building up through the year rather than coming in big bursts like we’ve seen in years past. 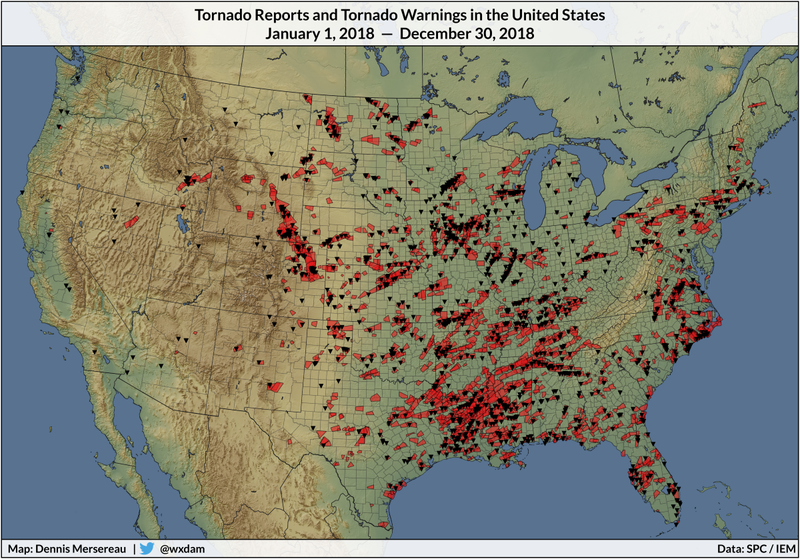 The biggest single day for tornadoes reports in the U.S. was Halloween, when the SPC received 61 tornado reports, followed by April 13 (46 reports), December 1 (38), July 19 (31), and April 3 and November 11 tied at 28 tornado reports. It’s notable that only two of the six biggest tornado days this year occurred in the springtime, which is typically the peak of tornado activity across the country. 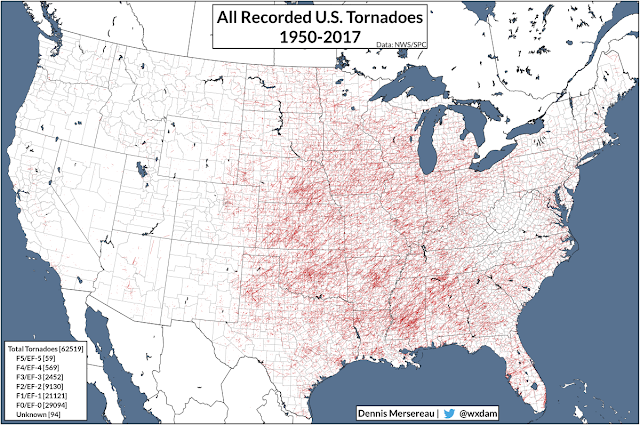 We also made it through the year without recording any EF-4 or EF-5 tornadoes anywhere in the United States, the first such year on record. The last EF-4 tornado in the U.S. touched down in Texas in April 2017, and the last EF-5 struck Moore, Oklahoma, in May 2013. It’s no surprise that an unusually quiet year populated by off-season tornado outbreaks would see the bulk of tornadoes touch down outside of what is traditionally considered Tornado Alley. The stretch of the Plains from Texas to the Dakotas saw fewer tornadoes than usual. Nobody died in an Oklahoma tornado this year for the first time since 2006. Most of the tornadoes we saw this year touched down in the southeast or Upper Midwest. There’s a strong argument to be made that the United States’ “tornado alley” is actually shifting (or at least expanding) east toward the Deep South—covering states like Louisiana, Mississippi, and Alabama. Noteworthy tornadoes occurred in central North Carolina—where an EF-2 tornado cut through the city of Greensboro and very close to where I live—as well as Maryland (hitting the aforementioned Amazon warehouse) and a photogenic tornado that hit central Iowa at the same time a severe thunderstorm capsized a duck boat in Missouri, killing 17 people. Tornadoes striking without warning is a popular narrative news organizations use to cover devastating tornadoes. But the fact of the matter is that most tornadoes that injure or kill people are warned in advance—it’s just that some people in the path of the storm don’t hear the warning in time. However, some tornadoes really can (and do!) strike without warning. 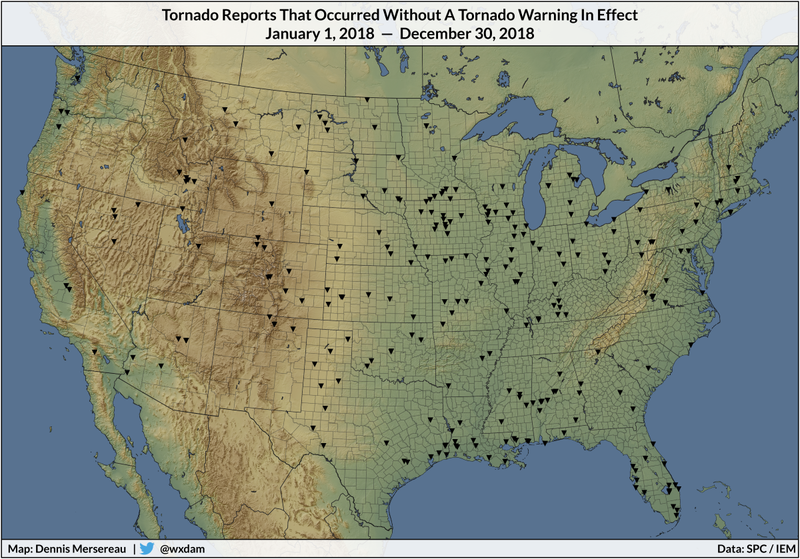 I combed through the tornado reports and tornado warnings issued between January 1 and December 30 and found more than 100 tornado reports that didn’t coincide with any tornado warning polygons at any point during the year. Now, not all of these tornado reports were confirmed tornadoes. Some likely wound up being damaging straight-line wind events once crews took a better look on the ground. But it’s a stark reminder that warningless tornadoes can happen anywhere in the country—from coast to coast—and that it’s more important than ever to take strong thunderstorms seriously even if they lack a tornado warning. An ambitious butterfly could make it from Orlando to Buffalo in a couple of minutes if it flew high enough on Friday. 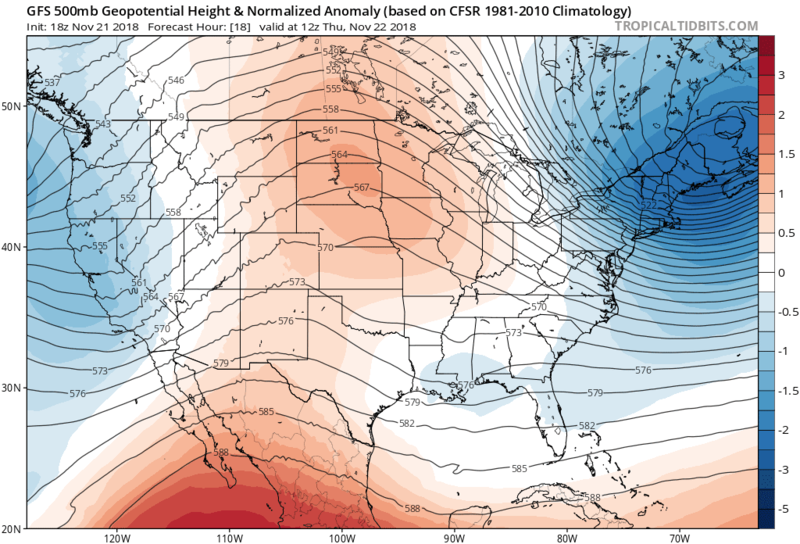 An incredibly amplified trough entering the eastern United States will bring this week to the same dreary close we saw last week. 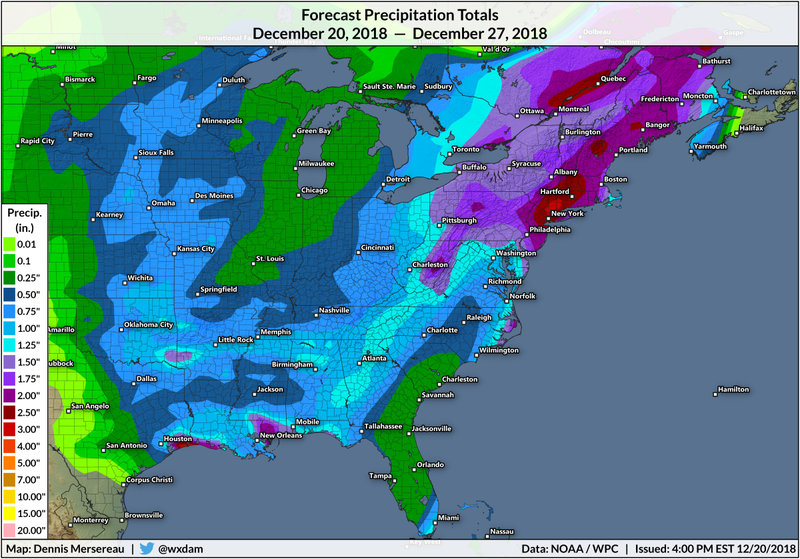 In addition to lots of heavy rain and dangerous thunderstorms in Florida, the resulting surface low could bring some of the lowest air pressures ever recorded during the month of December in the Mid-Atlantic. A line of severe thunderstorms was ongoing in Florida at the time of this post. It's a classic wintertime severe weather setup for this part of the country. 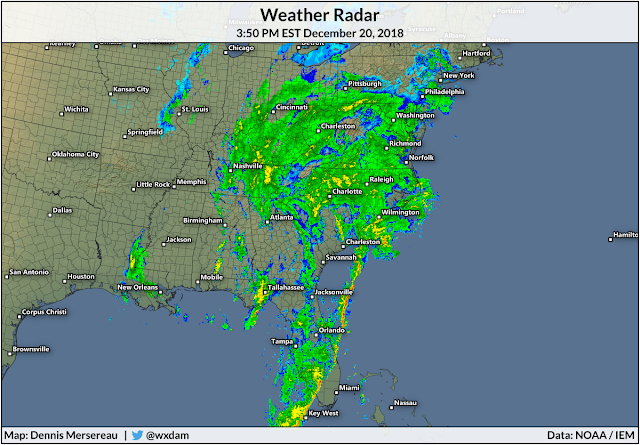 Warm, moist air ahead of an advancing cold front allowed a line of strong thunderstorms to sweep across the Florida Peninsula. Cooler, drier air will follow soon after the rain stops, bringing comfortable conditions as far south as Cuba and Mexico's Yucatan Peninsula through the weekend. A slog of steady, heavy rain will coat just about every square inch of the East Coast between now and Saturday. Most areas can expect an inch or two of rain with heavier totals likely in areas that experience thunderstorms. Some of the storms in the Carolinas could be severe on Thursday night, packing the risk for damaging winds and possibly an isolated tornado. 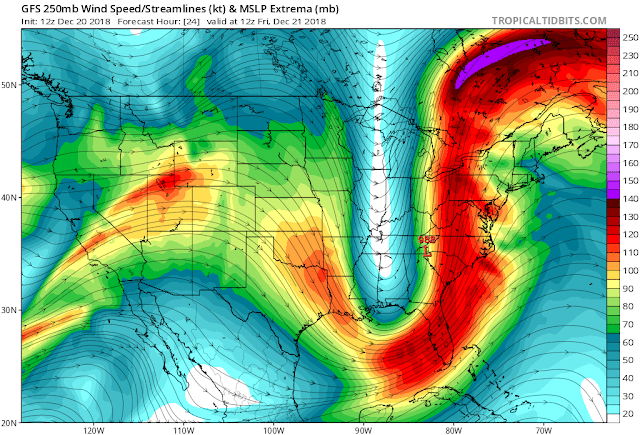 A sharp trough like that is impressive enough on its own, but the combination of the amplified trough and strong winds of the jet stream within will strengthen the surface low moving over the Carolinas tonight and Friday. The latest forecast from the Weather Prediction Center shows the minimum surface pressure at the center of the low potentially reaching 987 mb on Friday as it moves over western North Carolina and Virginia. A surface pressure of 987 mb is extremely unusual for this part of the country during this time of the year. Surface pressure records compiled by David Roth at the WPC show the lowest air pressure recorded during the month of December in Greensboro, N.C., was 988.8 mb, and 986.5 mb up the road in Roanoke, VA. It'll be a close one. The lower air pressure itself won't really have much of a direct effect other than kicking up a stiff breeze and possibly making your joints achier than usual. Other than that, it's just a novelty. A strong tornado touched down in Port Orchard, Washington, on Tuesday, damaging several homes and businesses along its path. Meteorologists will conduct storm surveys on Wednesday to assign the tornado an EF-Scale rating, but pictures from local news organizations and social media seem to show that this was a formidable tornado in a part of the country that doesn't typically see this kind of weather. Today's tornado in Port Orchard—which is next to Bremerton and about 30 miles west of Seattle—is a stark reminder that A) tornadoes can happen anywhere in the United States, and B) a significant number of tornadoes in the United States truly occur without warning. The nasty weather today in the Pacific Northwest is directly tied to the same low-pressure system that generated all of the epic waves that hit the West Coast a couple of days ago. A long fetch across the northeastern Pacific Ocean allowed wave heights to reach 50 feet, posing significant risk to anyone ill-advised enough (to put it nicely) to go swimming or even just wander to the ocean's edge. Bursts of showers and thunderstorms moved across western Washington during the day on Tuesday, producing dozens of lightning strikes along the way. (That's nothing east of the Rockies, of course, but even one rumble of thunder out west is a talking point for days.) At least one of the thunderstorms was strong enough to tap into enough low-level wind shear to begin rotating. The thunderstorm that produced today's tornado had a fairly pronounced signature on it as it crossed the Kitsap Peninsula. 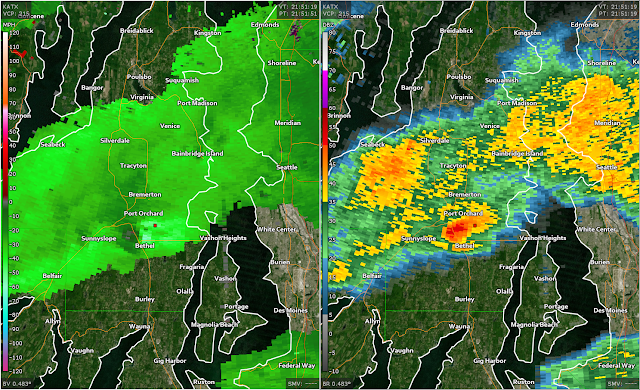 The storm's rotation grew strong enough to produce a short-lived tornado once it reached Port Orchard. Social media lit up as onlookers recorded a funnel that was mostly obscured by heavy rain but clearly present due to the immense amount of debris kicking up into the air. The thunderstorm quickly fell apart after the tornado touched down as more stable air wrapped in and choked off the instability feeding the storm. We only had five-minute radar scans of the storms in northwestern Washington today—we're spoiled by rapid-scan radar imagery these days—but we did get a radar sweep at a critical moment: 1:51 PM PST, during or immediately after the tornado touched down and caused the most damage. That sweep took place at just the right moment to allow us to see debris in the air. Dual polarization technology allows us to see the size and shape of the objects showing up on radar. Correlation coefficient (CC) tells us how similar or dissimilar airborne particles are to one another. Raindrops have a high CC value because they're all pretty much the same size and shape. Tornado debris, on the other hand, has a low CC because you're seeing everything from branches to vehicles being lofted into the air by the tornado. Here's a two-pane radar image from Port Orchard around the time of the tornado. The left pane shows CC values while the right shows precipitation. The debris on the CC imagery stands out as the dark blue circle near the center of the pane on the left. The radar beam is about 3,100 feet above ground level when it reaches the location of the tornado. Even if we didn't have videos of the tornado in progress, a quick look at that kind of a debris signature that high above the ground is a sign of a strong and sizable tornado. It's common to see this somewhere like Alabama or Kansas, but not Washington. The Storm Prediction Center has more than 62,500 tornadoes in its database since reliable records began in 1950. Since then, only about 100 of those tornadoes occurred in Washington. Heck, there are so few tornado tracks in Washington that you can barely make them out on a map of the whole country. You have to zoom in on the state to see them. 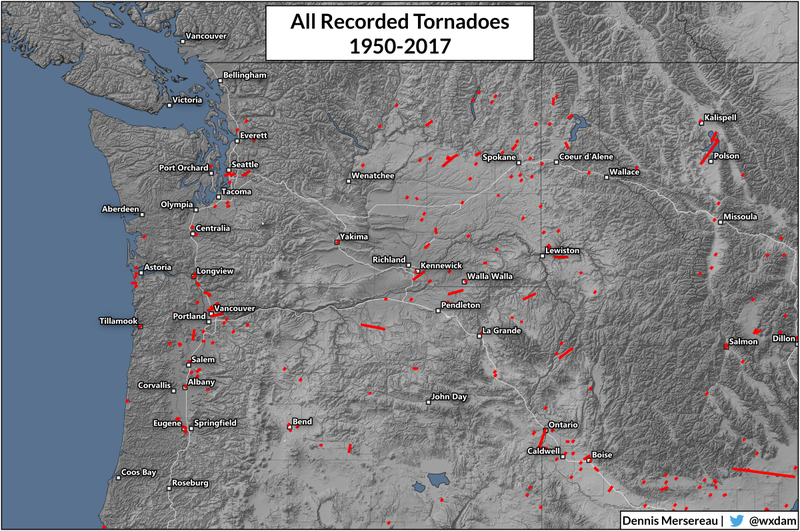 Most of the tornadoes reported in Washington over the past seven decades occurred along the coast, in valleys, and in the eastern part of the state where thunderstorms aren't as hampered by terrain and a stable marine layer as out west. The majority of Washington's tornadoes were relatively weak and short-lived. The Storm Prediction Center's tornado database shows 121 tornadoes recorded in Washington between 1950 and 2017. More than half of those tornadoes—69 of them—were an F0 or EF-0 on the Fujita and Enhanced Fujita scales. (The Fujita scale was updated as the Enhanced Fujita Scale in 2007.) Only three tornadoes in Washington have produced F3/EF-3 damage. Based on pictures of the damage, today's tornado is likely to get at least an EF-1 rating, if not higher. Tornadoes are rare in Washington, and strong tornadoes are even rarer yet. They're so rare, in fact, that the National Weather Service office in Seattle hasn't issued a tornado warning in more than four years—including today. Residents of Port Orchard had no tornado warning or severe thunderstorm warning before the tornado touched down. They only knew there was a tornado if it hit them, they saw it, or they heard about it afterwards. For all the talk of false alarms when it comes to tornado warnings, an uncomfortable fact we have to live with is that quite a few tornadoes actually wind up going unwarned. The National Weather Service fails to issue a tornado warning for 30-50% of all tornadoes that form each year. The agency does better warning for tornadoes that occur during organized outbreaks than in one-off situations like we saw today. Several inches of heavy rain on Friday and Saturday could lead to flooding to parts of the southeast and Mid-Atlantic. Some of the heavy rain will fall over areas that saw more than a foot of snow just a couple of days ago. The abundant snow deposited by last weekend's historic snowstorm could lead to significant flooding in some areas. 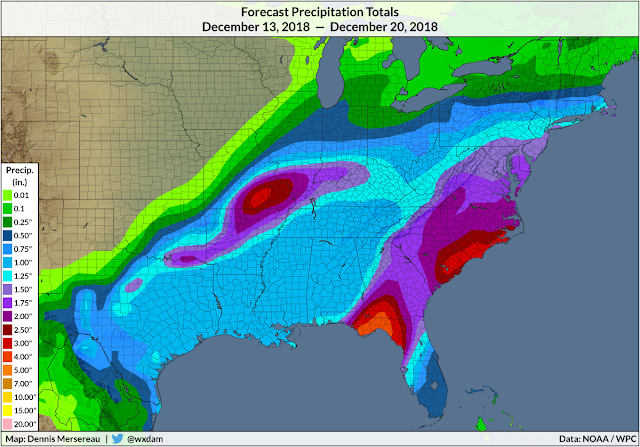 The upper-level low responsible for the upcoming rain made a mess of things in Texas this week—including intense winds and even some heavy snow—and it'll continue to swoop across the southeast over the next two days, creating a large shield of precipitation that should bring substantial rains to most of the southeast and Mid-Atlantic on Friday and Saturday. The latest precipitation forecast from NOAA's Weather Prediction Center shows a couple of inches of rain stretching from Florida through the Mid-Atlantic. 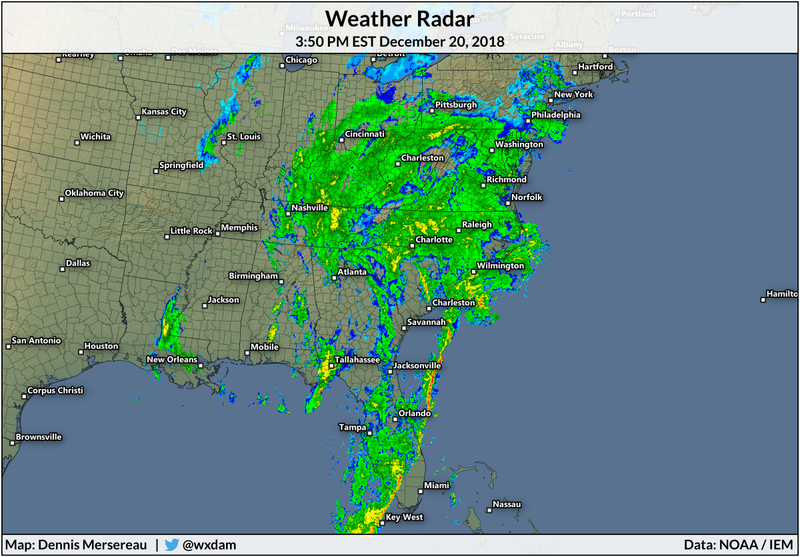 This kind of rain would lead to some flooding concerns under normal circumstances, especially if it falls in a short period of time, but the risk for flooding is enhanced due to the epic amounts of snow that still blanket the ground in interior parts of North Carolina and Virginia. We saw a historic snowstorm on Sunday that dumped enormous amounts of snow, with totals exceeding a foot across most communities between Interstate 85 in N.C. and Interstate 64 in Virginia. The resulting snowpack is thick and wet and it's hung in there pretty resiliently over the past couple of days. That's bad news when it comes to this much rain. Drains are clogged, which could lead to street and parking lot flooding. Snowmelt will add extra water on top of the rain, having a greater effect than just a couple of inches of rain straight-up.The rain will pool on the snow. The snow and wet soil beneath it will both prevent the rain from soaking into the earth effectively. In addition to the risk for urban street flooding, all that excess water could push local streams and creeks to flood stage. All those typical flood tips apply—be careful where you drive, have a secondary route, don't drive through a flooded roadway—but pay attention to where you park, as well. I'm sure my apartment complex's parking lot will flood in spots because of the clogged drains, possibly endangering vehicles parked in those end spots. That could be a problem in large parking lots with poorly-placed snow mounds. The winter storm we've been watching for the past week is almost a certainty at this point. North Carolina stores are quickly running out of the staples as residents collectively realize that we'll be sitting around the house for a couple of days. A disruptive winter storm will trek across the southern United States this weekend, and the brunt of the snow and ice is expected to unfold across western and central North Carolina. Some locations could see more than a foot of snow, which is on the high-end of winter storms for this part of the country. Heavy snow is almost a certainty across much of North Carolina. Just about everyone west of Interstate 95 in North Carolina will see some amount of wintry precipitation from this storm. The heaviest snow will occur in the western and central parts of the state—think Asheville, Charlotte, and Greensboro—while areas east of there are more likely to see sleet, freezing rain, and plain ol' rain than anything else. It won't just be North Carolina. The major focus is on North Carolina, but the surrounding states will also see a thump of winter weather. The mountains of southwestern Virginia stand the best chance to see disruptive snowfall totals as well as sleet and freezing rain that could make it impossible to walk or drive and could expose residents to power outages. Snow and ice is also possible in parts of upstate South Carolina and the mountains of eastern Tennessee. Sunday will be the worst day. The low-pressure system will approach the state from the west on Saturday night. Snow will begin to overspread western and central North Carolina on Sunday morning and continue to grow in coverage and intensity through the day. The snow will be so heavy in spots that snow plows will have a hard time keeping up even on the major highways. Snow and ice may linger through Monday. The bulk of the heavy snow and ice should subside during the early hours of Monday, but some precipitation may linger through Monday morning. It's going to be incredibly difficult to travel in western and central N.C. on Monday anyway, so it won't make too much of a difference. Beware the wobbles. You've been warned. The effects of a storm like this are wholly dependent on the track of the low-pressure system. If the storm deviates even a dozen or two miles to the north or south of its current predicted track, that shift will mean all the difference for the location of the rain/ice/snow line and the axis of the heaviest snows. Likewise, if temperature profiles shift by a few miles, the sleet and freezing rain will follow. I guarantee you that some towns bracing for epic snows will see a decent snow followed by lots sleet or freezing rain, which will compress the snow into a dangerous sheet of ice. Lots of independent variables have to come together perfectly for a major snowstorm in this part of the country. It's hard to do. Some areas will flirt with records. North Carolina sees snow pretty reliably every year, but these annual snowstorms usually aren't blockbusters. They clip the state, drop something like 2-6" of snow, snarl traffic for a day or two and then everything gets back to normal. 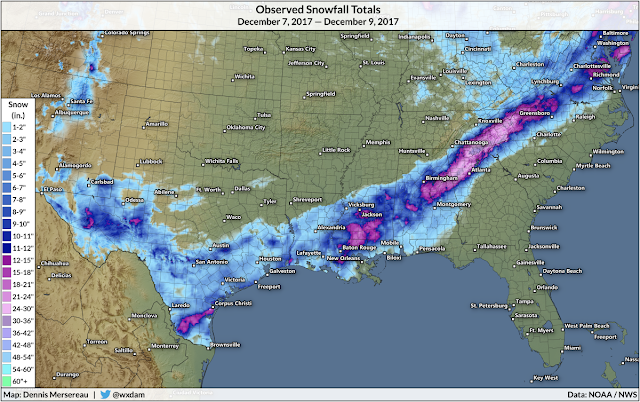 A big-time snowstorm with forecasts freely bouncing around figures like 12"+ is...not typical for this area! This state isn't great at handling snow. Drivers aren't used to driving in snow. Crews don't have enough equipment to keep the roads clear like they do up north. Heck, even many apartment complexes (mine included) don't plow or shovel, leaving residents stranded in their parking spots if they don't have a vehicle that can traverse a foot of snow. Sorry folks, state's closed. When we get lots of snow like what's forecast for this weekend, it shuts everything down until the snow can melt. I guarantee you that there's some county in this state that will have no school all week. Before you scoff, think about what happened a few weeks ago when road crews in the New York City metro were caught unprepared for snow that was heavier than forecast. Plows couldn't keep up with the snow, grinding traffic in the NYC metro to a halt. Remember how easily things fall apart the next time you see the infamous flaming snow car. We're close enough to know some snowfall totals now. The latest forecast from the National Weather Service and the Weather Prediction Center (whose forecast is shown in my map above) is pretty settled into a significant, disruptive snowstorm across the western half of North Carolina. These snowfall totals are subject to change over the next day or two as forecasters refine their thinking on the track of the storm and location of the freezing line above the surface. 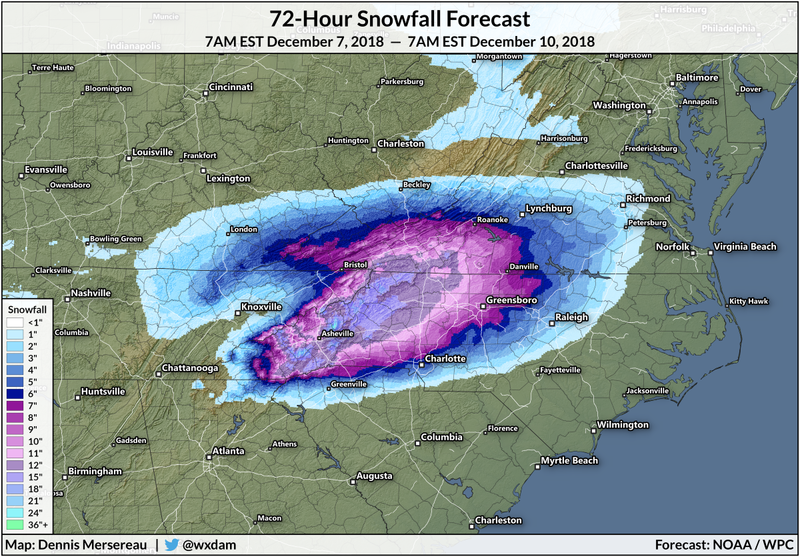 Western North Carolina: The mountains of western North Carolina stand the best chance to stay all-snow during this storm. It's likely that many areas here will easily see more than a foot of snow by the end of the storm. Some lower elevations may start to mix with sleet or freezing rain by the end of the storm on Sunday night—compressing and glaciating the blanket of snow—but many areas will escape this fate. North-Central North Carolina: Communities (like mine!) in the middle of the state near the Virginia border could see hefty snowfall totals, but they also run a decent risk of seeing ice mix in with the snow. We could push double-digit totals in places like Winston-Salem, Greensboro, Burlington, and Reidsville if we manage to stay mostly snow. Totals will drop precipitously (sorry) if sleet or freezing rain begins to mix in. The deepest snows should occur north of Interstate 40/85. South-Central North Carolina: Locations along and south of I-85 stand the best chance to see ice during this storm, which could significantly limit snowfall totals and make the storm even more dangerous than if it were pure snow. That sharp cutoff is readily apparent on the Weather Prediction Center's snowfall forecast, shown above. Virginia: Most of the snow in Virginia will fall across the southern part of the state near the North Carolina border. The cities with the best chance for significant snowfall totals are Roanoke, Blacksburg, Martinsville, and Danville. Accumulating snow is possible as far north as I-64. The storm should stay far enough south that Virginia shouldn't have to deal with much ice at all—precipitation here should remain all snow. South Carolina: There will be a sharp cutoff between snow, ice, and rain close to the low's track as it moves across Georgia and South Carolina. The most snow will fall in far upstate South Carolina, with the heaviest totals likely right along the NC/SC border. Tennessee: Given the complex setup of cold air that's allowing it to snow and sleet and freezing rain in the first place, much of Tennessee should be spared from the wintry effects of this storm. The mountains right along the NC/TN border will see heavy snow, but there will be a sharp cutoff in snowfall to the west. Who's going to get ice? Freezing rain is most likely across northern Arkansas, parts of Tennessee, and some parts of central North Carolina that wind up right on the line between snow and rain. All of the areas that experience freezing rain will have impassable roads until the ice starts to melt. You can't drive on a sheet of ice no matter how good you think your vehicle is. Get ready for power outages. The combination of heavy, wet snow, gusty winds, and freezing rain will lead to power outages in some areas. They shouldn't be as widespread as you'd see after a severe thunderstorm outbreak or a horrific ice storm, but some areas will lose power during this storm and they may not get it back right away. That's no good when it's cold and wet. Make sure you're prepared for a power outage with food you don't have to cook, batteries to power things like flashlights and radios (remember those? ), and a way to charge your cell phone in a vehicle or with a portable power pack. There's going to be lots of heavy rain. Areas that don't get to see wintry precipitation will still see rain—and lots of it. 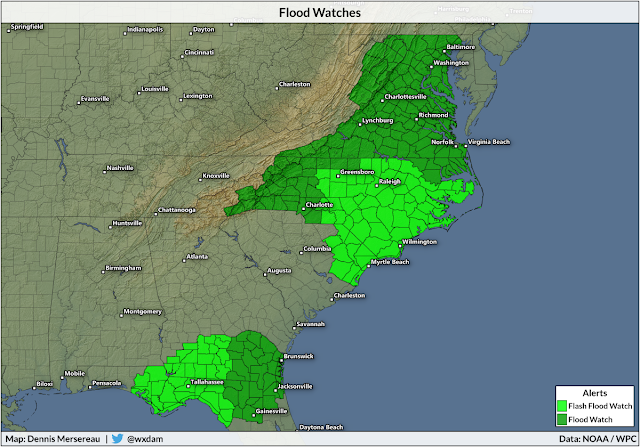 Some parts of the deep south will see flooding rains from this storm. 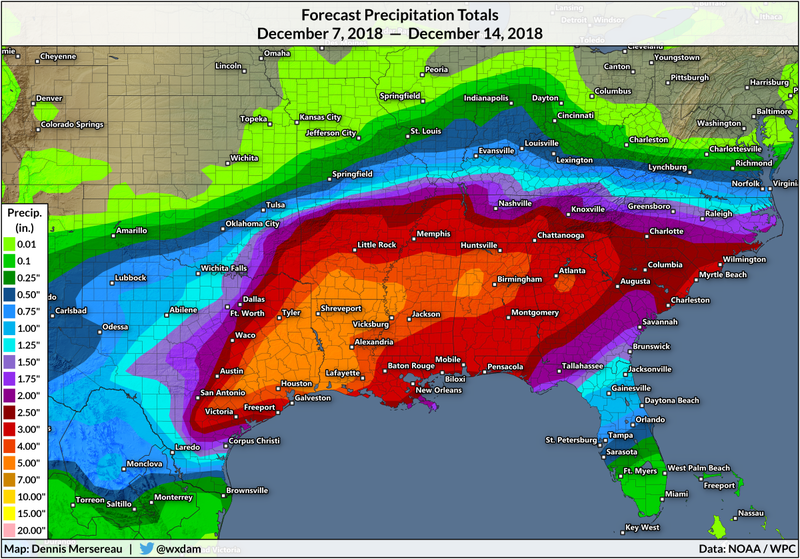 The latest forecast from the Weather Prediction Center shows a widespread area of heavy rain stretching from central Texas to the coast of the Carolinas. Widespread parts of Texas and Louisiana could see more than 5" of rain. This kind of rain in such a short period of time will lead to flooding issues. Some severe thunderstorms are also possible. As if everything else isn't enough, some severe thunderstorms are possible along the northern Gulf Coast on Friday and Saturday. The main threats will be damaging winds and quick tornadoes. The threat warrants paying close attention to watches and warnings as they're issues. Some of the storms will occur at night, so it's a good idea to make sure your cell phone has the ability to receiving warnings and audibly warn you when it receives an alert. This storm is a classic setup for snow and ice across the southeastern United States. The overall setup behind this snowstorm involves a low-pressure system moving across Georgia and South Carolina and a high-pressure system over the Mid-Atlantic. The low to the south is responsible for the precipitation and the high to the north is responsible for the cold air. Winds flowing clockwise around the high will place a pool of subfreezing air against the Appalachian Mountains in North Carolina, a scenario known as cold air damming. It's very hard for warm air to scour away the cold air at the surface, so any precipitation that falls into this pool of cold air falls in the form of snow, sleet, or freezing rain. 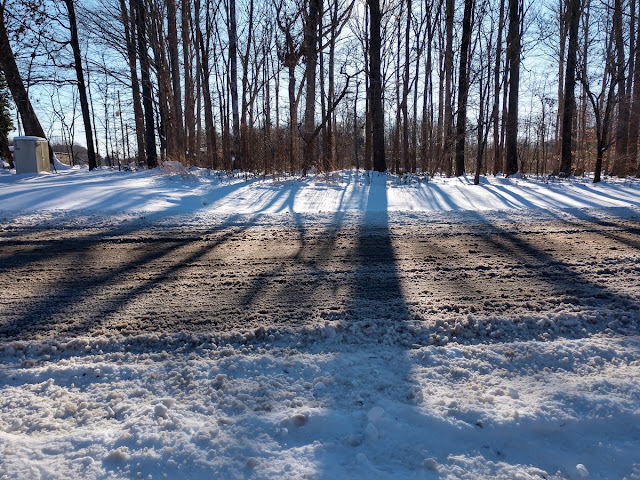 A situation like this can lead to prolonged ice storms in central and western North Carolina, but if temperatures are cold enough and the layer of cold air is deep enough, it can also lead to a significant snowstorm. Many communities in the path of this storm will be right on the line between snow and ice, which is why the snowfall forecast is so uncertain. Many of the high-end totals you're hearing will only happen if no sleet or freezing rain mixes in with the snow. Ice will compress a blanket of snow in a flash, turning the snow into a slushy, soon-to-be-glacial sheet of misery that can quite literally strand people where they are if they don't have the equipment or vehicles to remove or traverse a thick coating of ice. 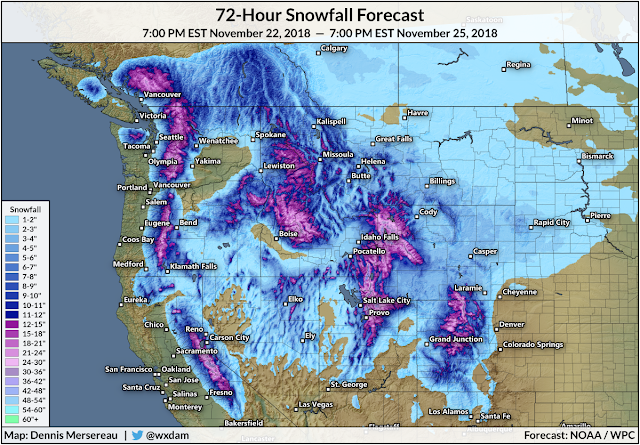 Snowfall totals from the storm of December 7-9, 2017. This snowstorm is happening one year to the day that another early-season snowstorm rolled across the southeastern United States and dropped significant amounts of snow. The former storm produced more than half a foot of snow near Corpus Christi, Texas, one of the biggest snowstorms ever recorded in that part of the country. The storm we'll see this weekend isn't anything like the storm a year ago. The previous storm followed a path that took it from Texas to New England, dumping heavy snow along a path that stretched from the Mexican border to the Canadian border. This weekend's storm is on a more west-to-east track, bringing it straight across from Texas and Oklahoma to the Carolinas before it hooks out to sea in the western Atlantic. 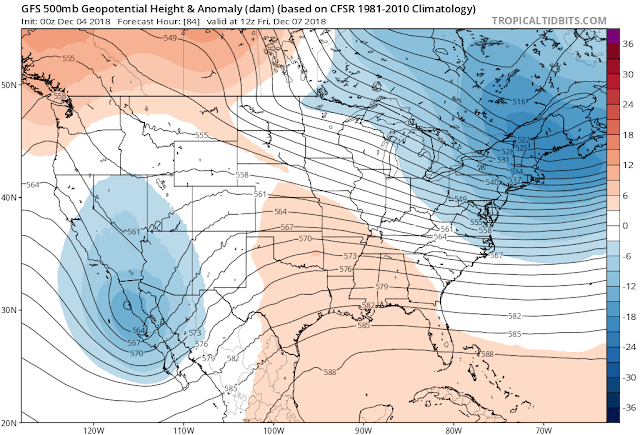 A trough approaching California this week could spread wintry weather from the Rockies to the Atlantic next weekend. It's too early to know exactly what type of precipitation people will see and exactly how much will fall. Lucky for us, those specifics are all anybody wants to know. Fun fun. Cue up the scary news graphics and melodramatic reporting—it's (possibly) time for a winter storm! A storm looks likely late this week. 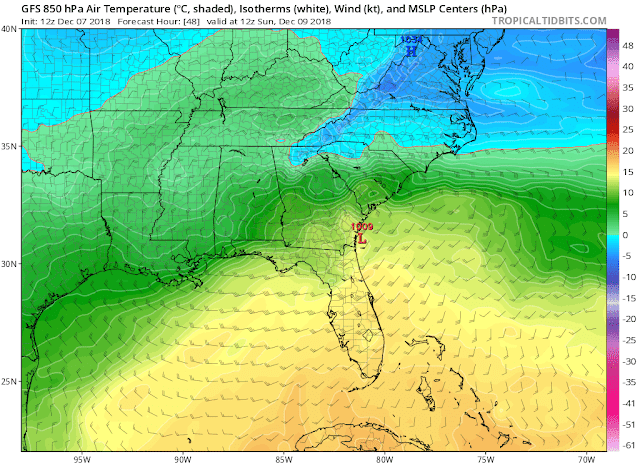 For the past week or so, weather models have consistently shown a low-pressure system developing in the southern Plains and sweeping across the Southeast through next weekend. While the timing, extent, location, precipitation types, and amounts—basically everything—are all iffy, it's pretty likely that a storm will form. That's the first hurdle. California is first up to the plate. 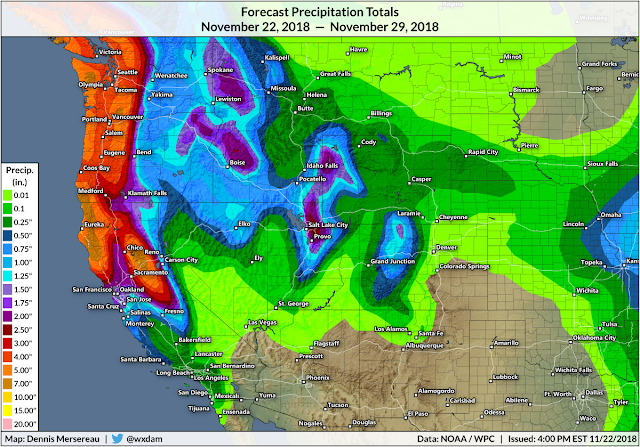 The first wave of precipitation will move across California beginning late Tuesday. 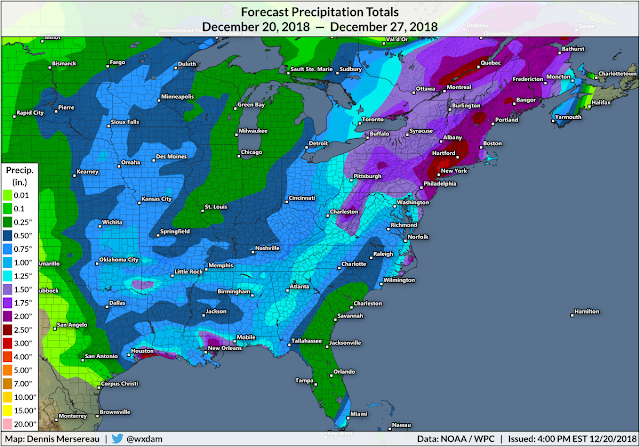 The latest forecast from the Weather Prediction Center calls for rainfall totals of an inch or two along higher elevations near the coast, while most metro areas will stand to see at least some measurable precipitation. It probably won't be a lot, but it's better than nothing. The main storm will form once the trough crosses over the Rocky Mountains at the end of the week. The track of the low-pressure system will determine who sees rain, snow, ice, and how much of all three will fall. Snow will be likely along the northern edge of the storm. Folks along and south of the track of the low can expect a chilly rain (and maybe even some thunderstorms). The low's track wiggling a few dozen miles to the north or south will mean all the difference for a whole lot of people between Oklahoma and Virginia. This is especially true for the eastern side of the Appalachian Mountains where cold air damming—cold air at the surface getting dammed up against the mountains, forcing warm air to ride above it—frequently wreaks havoc on precipitation types during the winter. We (mostly) know the timing. California Rain: Begins Tuesday and lasts through late Thursday or early Friday. Plains: Snow/ice begins Friday evening. There's a chance that this could be a long-duration event once the bulk of the storm moves east of the Mississippi River. 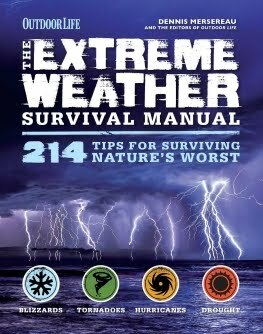 Winter storms that hit south of the Mason-Dixon line usually come and go in 12-18 hours tops. That might not be the case with this storm, but that could certainly change in the coming days. We don't yet know exact snow/ice amounts and who could see what. Essentially, we don't know all of the details that people actually want to know. That kind of information will become clearer later this week once we're closer to the event and weather models have a better handle on the environment leading up to the storm.We know there will be a storm and we know the setup could be conducive for disruptive snow or ice if the storm takes the right track and encounters the right environment. Beyond that, it's just too darn early to know specifics. That isn't stopping The Internet, of course. The internet-to-reality forecasting cycle is a nasty one. More than a week ahead of a storm, meteorologists and weather enthusiasts will post some scary-looking model images to social media long before they're useful. These posts go viral. They know they'll go viral. That's why they're posted. We're not stupid. Now you've got thousands of people who heard that "they" are predicting a big winter storm and "they" are calling for exactly six inches of snow over grandma's house and three inches of snow over Suzie's school and so on and so on. "They," of course, are the meteorologists who are stuck cleaning up the mess from these viral posts. Forecasters now have to mention the potential for a storm long before it's certain. That's why I have to write this daggone post on a Monday night. This post and those forecasts are all dripping with uncertainty. But, no!, that can't be, because we don't like uncertainty. We like it when meteorologists talk in specifics because our society at some point decided saying "I don't know" is code for "I'm a dunce who can't guess where my mouth is." That's why you get maps from weather models on your Facebook feed and forecasts on your smartphone app spitting out snowfall amounts down to the nearest tenth of an inch. 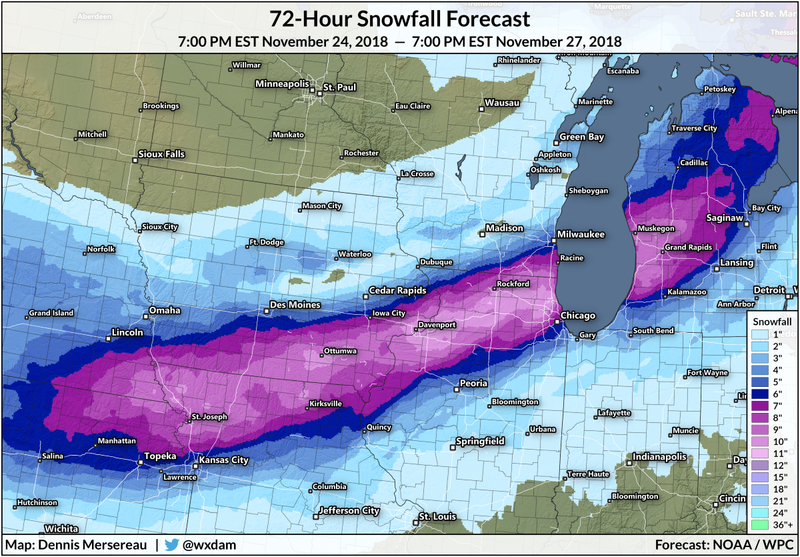 Meteorologists like to talk smack about people posting "snow maps," or snowfall accumulation maps generated by weather models like the GFS or the Euro. But you know what annoys me? Checking Wunderground or The Weather Channel's forecasts ahead of this storm. The forecast changes every time I check the extended forecast. It's not just misinterpreted models or misguided meteorologists or no-name weather apps doing people a disservice. When someone who only casually pays attention to weather forecasts opens the app or website of a known-and-trusted company, they're seeing a definitive forecast for a storm that's more than five days away. Take a look at this ridiculousness. I live just north of Greensboro, North Carolina. Here's what the Wunderground ten-day forecast looked like for my location on Sunday and Monday. 3:30 PM Sunday — 5-8"
5:43 PM Sunday — 1-3"
2:22 PM Monday — 9-15"
3:11 PM Monday — 4-8"
8:37 PM Monday — 6-10"
I mean, there are layers of wrongness wrapped up in these forecasts. What's even worse is that this kind of jerky lurching between each forecast update isn't much better than the enthusiasts and meteorologists who post every run of the weather models to their Twitter feeds. Wunderground—and, by extension, The Weather Channel—aren't the only offenders here. I mean, hell, AccuWeather pretends to know what the low temperature and morning wind speed will be 90 days from now. 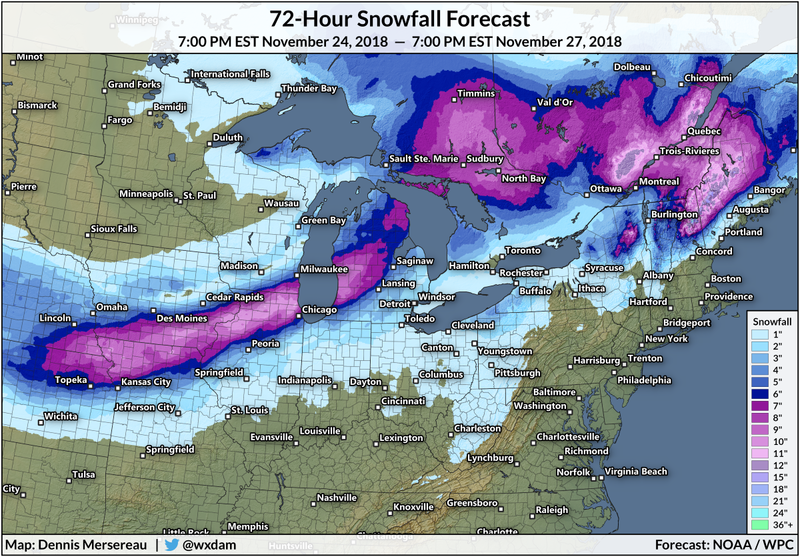 My mom used to use WeatherBug for her forecasts, so I know that they're even more aggressive than Wunderground about constantly changing their snowfall totals with each run of the models. These websites aren't personal opinion pages where one person is at fault for misleading their tens of fans. These forecasts are going out to tens of millions of people. How many of those consumers know that there are enormous caveats to that forecast of X-Y inches of snow this weekend? How many people, folks who don't eat and breathe weather forecasts, know that the forecast for Wednesday is much more accurate than the forecast for Sunday and Monday? We like to direct our ire toward "weather weenies" and careless meteorologists. But the big companies deserve it, too. They're the ones most people are listening to right now. Anyway, the most prudent course of action is to follow trends from now until Wednesday night or Thursday, and it's only then that you should start to pay attention to specific amounts. Anything earlier than that will lead to throbbing headaches, bad plans, and angry Tweets. Clouds to the left of me, icicles to my right, here I am, stuck in the middle with you. That's pretty corny, but we're going to be knee-deep in mashed potatoes and green bean casserole tomorrow, so who cares, right? It's going to be a wild couple of days for weather across the United States. Well, unless you live in the central part of the country, in which case it'll be pretty nice until early next week. Rain is a welcome sight across California as the state reels from the deadliest and most destructive round of wildfires in the state's recorded history. Hundreds of residents of Paradise, California, remain missing or unaccounted for after fast-moving wildfires completely engulfed the town, located in the northern part of the state near Chico. The fire killed at least 81 people and burned more than 153,000 acres—an area equivalent to the size of the city limits of Chicago. California is in the second month of its (until now, rainless) rainy season, which begins in the middle of fall and typically stretches through the end of winter. 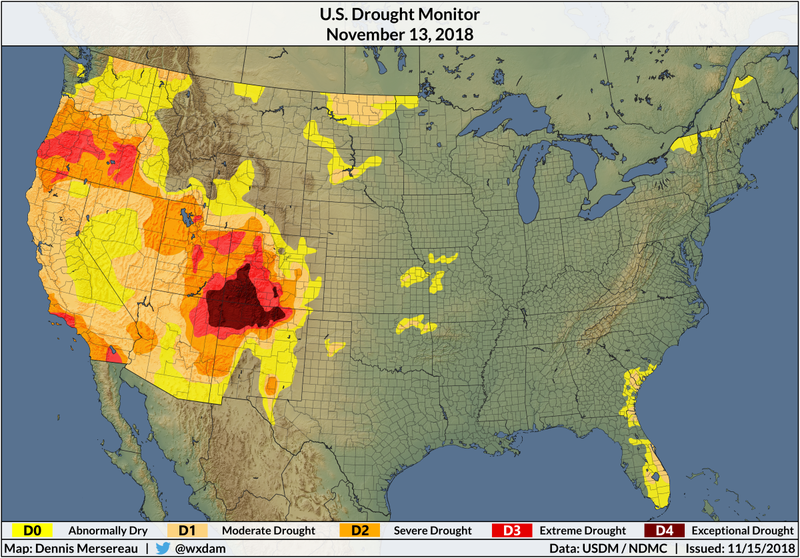 Most of California has been downright parched after a long, hot summer, and the extended dryness exacerbated the conditions that allowed the Camp Fire in Paradise and the Woolsey Fire in Malibu to grow into firestorms. Most of the focus is on California because it's, well, on fire, but really the entire Pacific Northwest—especially interior parts of Oregon and Washington—could really use the rain that's on its way. The rain will continue in waves over the next couple of days. The Weather Prediction Center expects several more inches of rain to fall between this evening and next Wednesday, with the heaviest totals expected along coastal areas between southern British Columbia and central California, as well as the higher elevations. Most of the mountain areas out west will see precipitation fall in the form of snow. The highest elevations could measure snowfall in feet over the next couple of days. This is great news for both the region's water resources and the tourism industry, which is heavily reliant on winter sports. The old cliché about "roller coaster" weather seems pretty apt this weekend, especially if you look at upper-level charts and temperature maps. The gyrations in winds and temperature patterns across the United States over the next couple of days kind of does trace a child's rendition of roller coaster tracks if you squint hard enough. We're in a pretty wavy upper-level weather pattern right now. 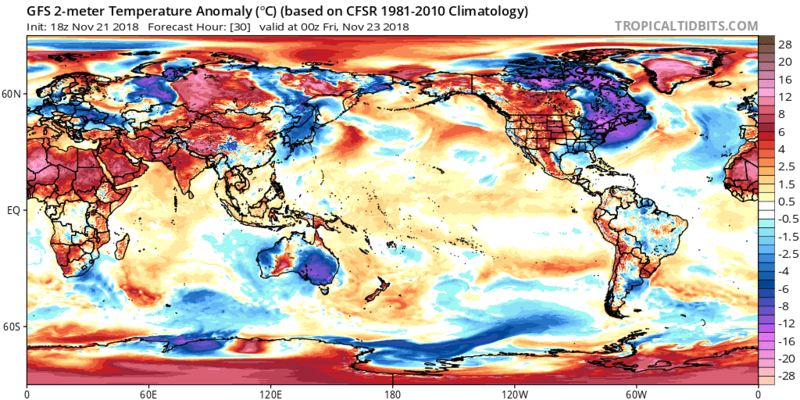 The United States and Canada are bookended by two troughs on either coast with a large ridge of high pressure across the central part of the continent. 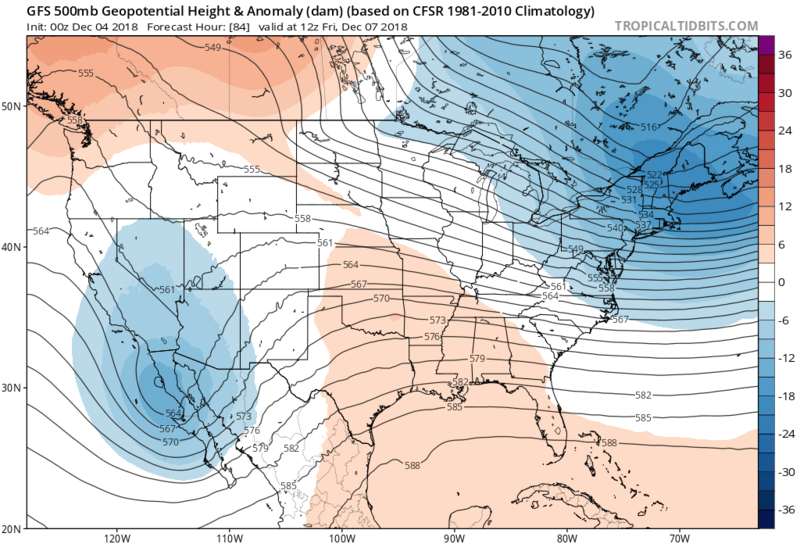 This trough-ridge-trough sequence is allowing for chilly temperatures and precipitation to prevail out west, generally sunny and mild conditions in the center of the country, and frigid weather in the Northeast giving way to a chilly, dreary rain this weekend. We'll probably hear quite a bit about the cold in the Northeast this Thursday and Friday. 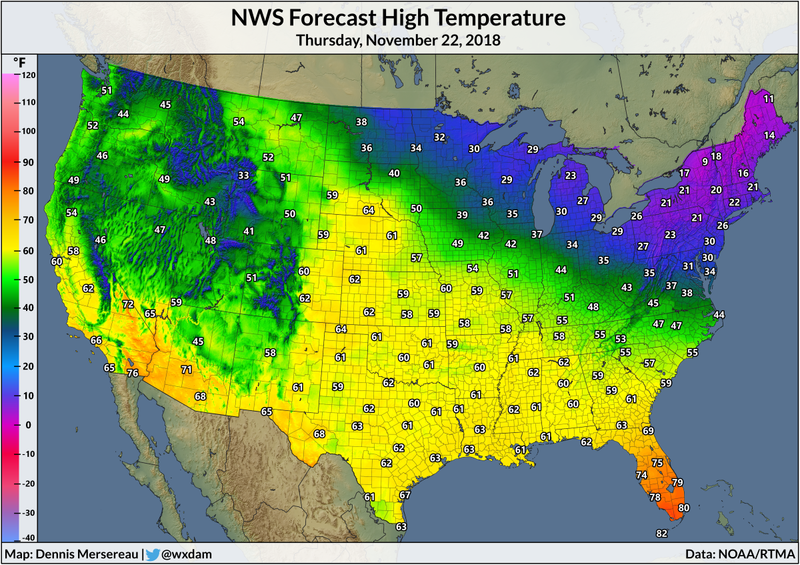 Both the high and low temperatures could be some of the coldest recorded on Thanksgiving in many years. Anyone watching the Macy's Thanksgiving Day Parade in New York tomorrow will likely hear the hosts make bad jokes about the cold every 12 seconds or so. 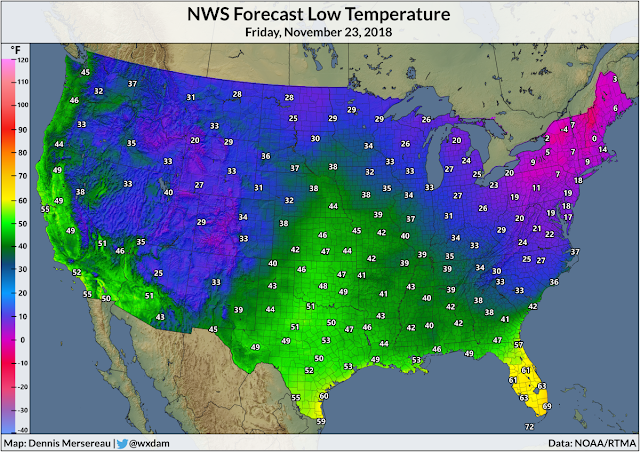 The only regions that really make out okay temperature-wise over the next couple of days will be the Plains, parts of the Midwest, and much of the Southeast. 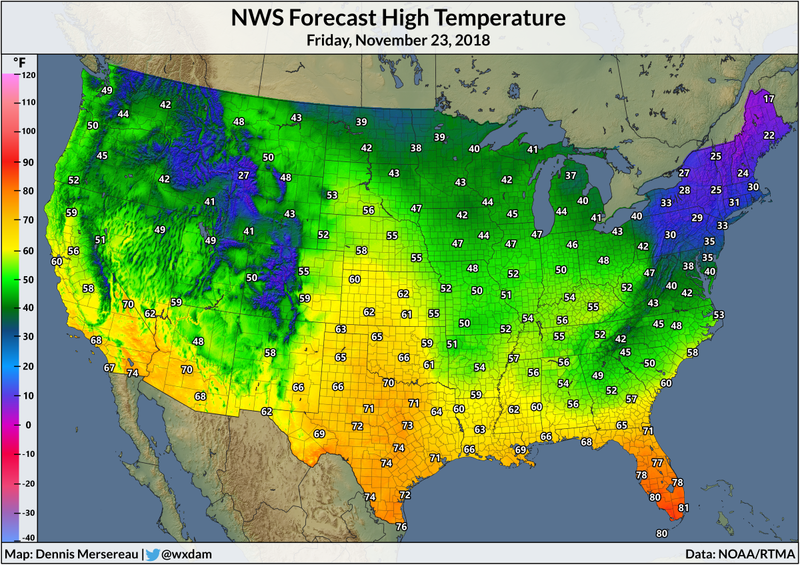 The trough over the West Coast will continue moving east through the weekend, and the cooler weather—including a potential snowstorm!—will pick up across the central part of the country early next week. Does Cold Weather Disprove Climate Change? Every year, we get people—some less firmly rooted in reality than others (hi Donald! )—who claim that every burst of below-normal temperatures that washes over the United States solidly refutes all of the evidence of "global warming," so take that, Al Gore. It helps to remember that the world is bigger than your backyard. California's worst wildfire in recorded history continues to burn this evening as rescue crews comb through the ashes of an entire town to recover the remains of those who couldn't escape in time. The billowing smoke from the latest round of historic wildfires has grown so thick at times over the past week that much of the region appeared shrouded by a toxic supercell on satellite imagery. This scene has repeated itself too many times in recent years, and there's no indication that it'll let up in the future. There are currently about a dozen fires burning out of control across California's vast countryside. Five of the fires are significant and one of them is unprecedented. The Camp Fire, located just east of the northern California city of Chico, is now both the deadliest and the most destructive wildfire ever recorded in California, and will likely end up as one of the worst in modern U.S. history. The Camp Fire destroyed almost every building the town of Paradise, California. Many of the 10,000 residential and commercial buildings that have burned down so far were destroyed not long after the fire started early in the morning on November 8. The latest update from local officials reported that there were more than 600 people either missing or unaccounted for. It's possible that a significant number of them may have been caught in the fire. But it's also possible that many of them just haven't been contacted since they fled with what little they could last week. Crews have worked at a feverish pace to knock down the flames, but adverse weather conditions and ample dry fuel has made stopping the fire a significant challenge.The fire has consumed more than 141,000 acres of land in the past week—placing the fire among the top-20 larges ton record, in addition to all the other tragic records—and it's just 40% contained as of November 15. Hundreds of miles away in southern California, another fire sparked around the same time as the Camp Fire up north. Called the Woolsey Fire, this fast-spreading conflagration prompted the evacuation of the entire city of Malibu, which is best known around the world as the home to multi-million dollar celebrity homes. Around 500 homes and businesses have been destroyed in the week since the fast-spreading Woolsey Fire sparked on November 8, killing two people and consuming nearly 100,000 acres of land. Crews have had better luck getting this fire under control; by the evening of November 15, the fire was 62% contained. The story behind these fires is the story behind just about every other significant fire we've seen in recent years. Exceptionally dry vegetation caused by too little rain allows even the tiniest spark to grow into a fire that spirals out of control faster than many can react. It's undeniable that the fires in California—really the entire western half of North America—are getting worse. The state's largest-ever fire burned just this past summer. The Mendocino Complex charred more than 450,000 acres of land. If you have no frame of reference for how much land that is—I sure don't—it's an area roughly the size of the Hawaiian island of Maui, or about the same amount of land covered by the suburban D.C. counties of Prince William and Fairfax combined. In fact, 15 of the 20 largest fires ever recorded in California have occurred since 2000, and 7 of those fires burned between 2010 and 2018. There isn't one specific factor we can point to as the cause behind these horrendous wildfires. It's a combination of several hazards. The fires are largely caused by humans. The fires grow enormous thanks in large part due to conditions brought about by a changing climate. And the fires are so destructive because we're building entire communities on land that was previously undeveloped woodland not long ago. The conditions that allow for California's wildfires to grow bigger than ever before—including lengthier and more frequent droughts and hotter temperatures—are all likely consequences of climate change that we're already dealing with. And things aren't going to get any better unless current global temperature trends start to reverse. California's rainy season is usually ramping up by the middle of November, but you wouldn't know it by looking at conditions across the state right now. The above rainfall graph is taken from Oroville Municipal Airport, which is located just a couple of miles south of Chico and the raging Camp Fire. The graph, which begins on July 1, shows the progression of the rainy season through the fall and winter months. 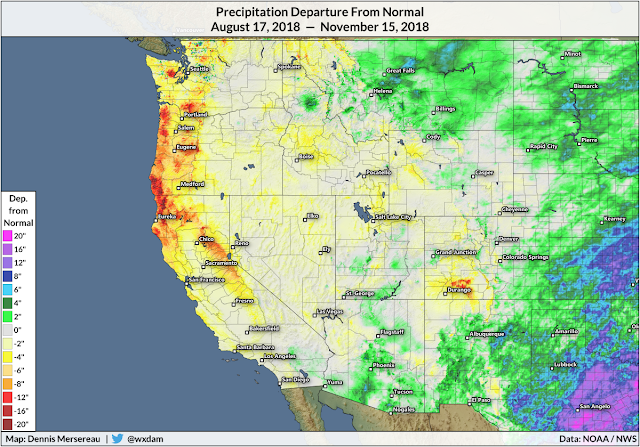 The flat green line at the bottom of the chart shows the almost-imperceptible amount of rain that's fallen across north-central California since the middle of this summer. They've seen virtually no precipitation even though they should have nearly five inches of rain on the books already. And so the story goes for much of the western United States. The land will continue to be ripe for explosive fire development when weather conditions allow for it as long as there's no rain to quench the parched vegetation that blankets the region. Fires spread most efficiently when the ground is parched from a lack of rain, the air is extremely dry with relative humidity levels in the single digits, and strong winds that help spread the flames faster than they can be contained. This is why the Santa Ana winds of southern California are so spectacularly dangerous, as we saw with the incredible speed at which Malibu's Woolsey Fire spread. The Storm Prediction Center, which also issues fire weather outlooks, shows no areas at risk for critical or extremely critical fire weather conditions over the next couple of days. The agency shows the risk for elevated fire weather conditions across higher elevations near the coast in southern California through the evening on Thursday, but no other areas with weather conditions favorable for explosive fire growth. These improved weather conditions should help firefighters—thousands of whom are prison inmates who work long hours for just a few dollars a day and no chance of getting a firefighting job after they're released, might I add—get a handle on the fires that are already burning. Rain-free conditions will prevail for the next week or so across California, though there is some hint in the models that there could be chances for rain around or after Thanksgiving, but it's a long way off and sadly it's way too early for specifics. Making matters worse is that it's a wet heat. The Iowa Environmental Mesonet shows that Miami has seen dew points of 76°F or warmer for nearly 1,700 hours so far in 2018, an excessively-muggy length of time that's second only to 2005. Dew points are generally considered to be oppressively humid once the value rises above 75°F. I've focused on Miami in this post because it's an extreme example of summerlike heat and humidity lasting well beyond its expiration date, but it's not just Miami that's suffering. The average daily temperature since September 1 is also sitting in record territory up at the major airports in Orlando and Tampa. It remains to be seen how much averages for the entire fall will moderate back toward normal with the upcoming cooldown. Ahhhh. That's nice. Air temperatures are likely going to remain warm for the next couple of weeks—hovering at or slightly above average most days—but the break in oppressive humidity will make it feel nicer and the relatively drier air will allow nighttime temperatures to finally fall back near normal for this time of year. 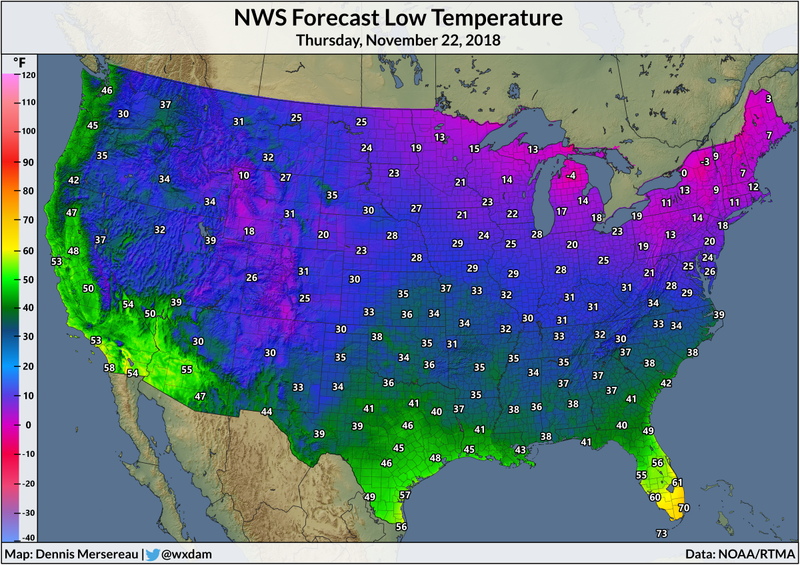 Communities near Pensacola will likely see a hard freeze on Thursday morning, and morning lows on Friday could dip into the 30s across inland areas as far south as Ocala. Low temperatures in the 40s may even reach the northern shores of Lake Okeechobee on Friday and Saturday.